Bashar Al-Assad: Mohamed Morsi Calls For "Jihad" Against Syria. Should We Care? On Saturday, President Mohamad Morsi announced that Egypt has shuttered its embassy in Damascus and has severed all diplomatic ties with Syrian President Bashar al-Assad&apos;s rogue government. The Egyptian president also declared support for a no-fly zone in Syria, in conjunction with President Obama&apos;s proposal for arming the opposition and a partial no-fly zone, and in a statement last week gave virtual carte blanche to any Egyptians seeking to fight "jihad" in Syria. This move comes more than two years into the Syrian conflict, which began as a popular uprising against Assad&apos;s dictatorship and was transformed into the brutal civil war we see today. As a fellow Arab state, it would seem that Egypt would have done more throughout the timeline of this regional catastrophe to support the Syrian people who have been murdered by the tens of thousands by Assad&apos;s forces and supporters. 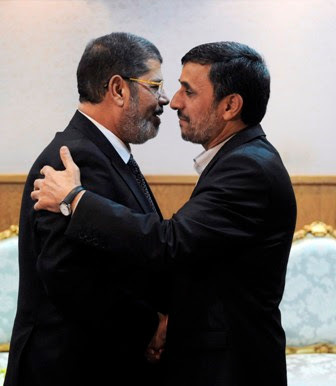 The idea early on was that President Morsi was seeking a "balanced" foreign policy for Egypt, and was thus seen cozying up to the Iranian leadership, perhaps far too much for anyone&apos;s liking (or viewing pleasure, for that matter). Just a week ago, when he declared support for jihad in Syria, he also asserted that he was against any foreign intervention in the Syrian matter — another statement that sits well with the Egyptian people. Should the Syrians — or Americans, for that matter — genuinely care that Morsi expressed populist solidarity (without saying that he would commit to sending American-trained Egyptian troops to help) with them this late in the game and at a time where it is very easy to do so, when American, E.U., and regional powers all preparing to take necessary action in Syria? Probably not. However, this timing is in fact significant, as this comes at a time where regional calculations are being redrawn on sectarian lines. One consideration is that this is posturing based on domestic politics: that the Muslim Brotherhood is attempting to distract the Egyptian people from domestic matters. Most immediately coming to mind is the upcoming June 30 protests for the "Tamarrud" campaign, where activists are seeking 13 million signatures for a public recall on Morsi&apos;s presidency one year after his election, citing a dismal track record and obvious consolidation of power measures for his Muslim Brotherhood bloc. Speaking to an activist in Cairo on Sunday, the sense that Morsi is trying to appease to more right-wing Islamist factions by allowing them and their supporters to go make "jihad" in Syria, is no real secret. What makes this move so convenient, aside from the reality that there is already a ton of Western momentum driving support for the Syrian opposition and action in Syria, is that the Muslim Brotherhood is not falling behind from other Sunni regional powers all invested in the Syrian proxy war. Saudi Arabia and Qatar have been actively supporting the political and armed opposition, and reportedly have had a big hand in providing Al-Qaeda&apos;s alias in Syria, the Al-Nusra Front, with weapons and money. Syria&apos;s Muslim Brotherhood has been banished outside of the country since Assad&apos;s father, President Hafez al-Assad, hunted them down during their uprising in the early 80s. Now, the Syrian Muslim Brotherhood is dominating the external opposition National Coalition of Syrian Opposition and Revolutionary Forces, or Etilaf, with no small help from Qatar, which has also been very supportive of President Morsi and the Egyptian Brotherhood. With that being the case, one could ask why Morsi has not jumped on the opposition&apos;s bandwagon until now. It was not until recently when the calls for holy war by Shi&apos;ite militant group Hezbollah&apos;s Secretary-General Hasan Nasrallah and prominent Sunni clerics such as Egyptian Shaykh Yusuf al-Qaradawi were made. With Nasrallah declaring that he would double-down on Hezbollah&apos;s commitment to support Assad at all costs, it is without surprise that the sectarian rhetoric is being reciprocated on clerical levels, and now, thanks to Morsi, on a national level. To prevent sectarian violence from defining the Middle East and Islamic World discourse for decades to come, a post-Assad Syria must be produced as soon as possible, as I explained here. Yes, it goes without saying that most Sunnis do not hate most Shi’ites, and vice versa, and that these ethno-religious identities are being hijacked by the fearful and those who seek to hold onto power. And one should not pretend that support from Egypt (the cultural capitol of the Arab world) is not a morale booster for the Syrian people and will not contribute to battle against the oppressing side, which in this case happens to be the Shi’ite axis. But foreign fighters flooding Syria should never be encouraged. If Morsi wants to support the fight on the ground, he should commit to working with U.S.-NATO and regional power efforts in an official, statesmanlike manner. And if the Brotherhood cares about the fate of the Middle East and what one would call a Muslim "ummah," or global community, rather than their own political fate, they would be wise to discourage such un-Islamic, polarizing rhetoric. The Syrian people deserve better support than this, and the Egyptian people definitely deserve better leadership.